Today, the length of the day and the length of the night are equal – in every place on earth. How cool is that! From tomorrow, the days will be longer than the nights in the Northern Hemisphere and they will officially enter spring. This is the ‘Vernal Equinox’. (‘ver’ is Latin for spring). Here in the South, it has officially been autumn since March 1st, not withstanding that the true ‘Autumnal Equinox’ is today. (‘autumn’ is already in latin!) The Bureau of meteorology says it sticks to calendar months because “it works nicely for everybody”. Contrary to what most people believe, the reason that summer is hotter than winter is not because we are closer to the sun in summer. 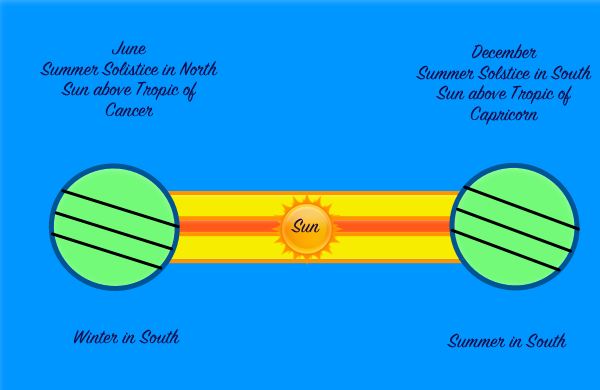 In fact, in the Northern Hemisphere, the orbit of the earth takes us further from the sun in summer. Summer is hotter than winter due to the tilt in the axis of the earth of 23 degrees. If there was no tilt, every day would be an equinox and there would be no seasons. Every day would be a bit like today. 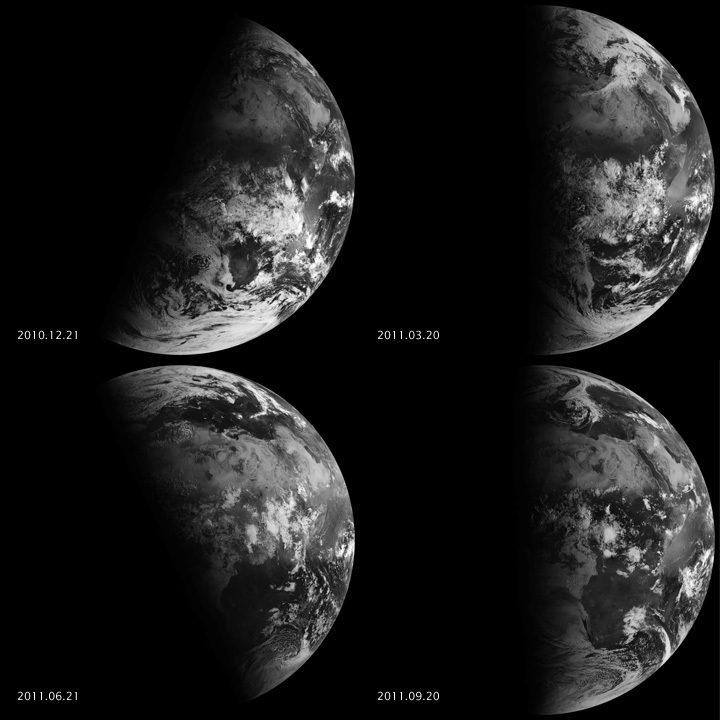 These photos from NASA show the amount of sunlight hitting the earth on different days. You can see the spring and summer equinoxes in the R hand photos. The top L is summer in the Southern Hemisphere, and the bottom L is summer in the Northern Hemisphere. – the days are longer, with more hours of sunlight heating the earth. – the sun is higher in the sky, meaning more sunlight shines on the earth more directly. I think the second explanation squibs it a bit, and would benefit from a more detailed discussion. Each morning the sun rises in the east and sets in the west. About midday it is at it highest point in the sky (the zenith) A shadow stick would cast no shadow if the sun was directly overhead – but this only happens if you are located in the tropics (and even then on only two days a year). 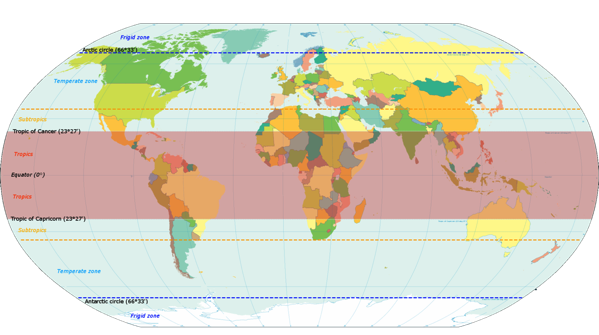 The tropics lie within 23.5 degrees of each side of the equator, between the Tropic of Cancer and the Tropic of Capricorn. Rockhampton, Longreach and Alice Springs are close to the Tropic of Capricorn. The Tropic of Cancer passes through India, Saudi and Mexico – so no place in Europe and no place in the USA is tropical. The Arctic and Antarctic Circles (at 66 degrees) mark the points north (or south) where there will be some days (or nights) that are 24 hours long. 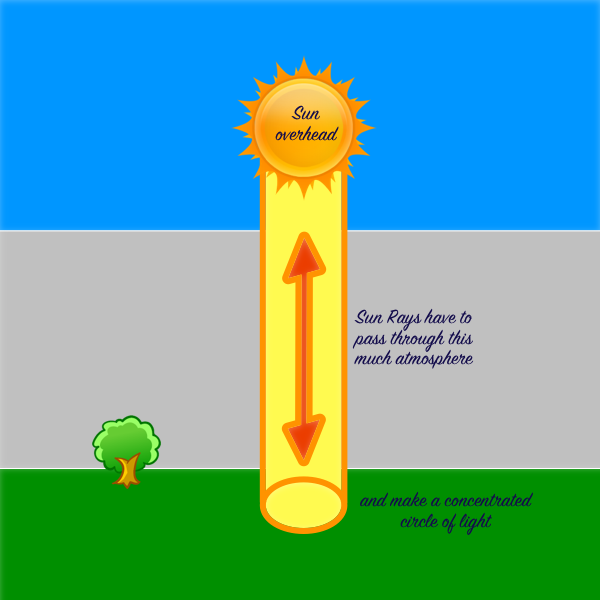 How ‘overhead’ the sun is makes a difference to how ‘strong’ it is – i.e., how much it heats things up. The less overhead it is, the less effective at heating things up. We notice the difference in heat between the high-in-the-sky sun at noon and the low-in-the-sky sun at sunset. These ‘overhead’ factors must be more important than the length of day. The days are much much longer in Stockholm (~ Lat 60 degrees N) in summer than they are here in Alstonweb (~ Lat 30 degrees S) but it is still much warmer here. The more the sun is directly overhead , the less spread out are its rays when they hit the earth. A torch shone straight down towards the floor gives a a circle of light, but tilt it a bit sideways and the light forms a stretched oval shape. The same amount of energy covers a larger area, so at any one point the light rays are less intense. The more the sun is directly overhead, the less distance it has to pass through the earth’s atmosphere. The earth is protected by the gases that make up the atmosphere. The gas molecules prevent the sun’s heat from burning us up by reflecting some rays and absorbing others. 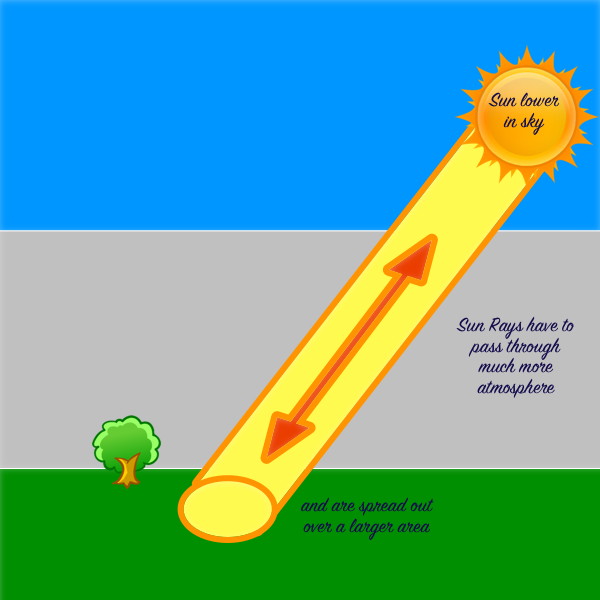 If the sun is less directly overhead, the rays have to pass through more of the atmosphere, and therefore are obstructed by more of the gas molecules. The earth’s atmosphere is 480 km thick, which means at the Equator the sun’s rays pass through 480 km of air. So the sun rays at Stockhom have passed through twice as much atmosphere as the sun’s rays at the equator. They are exhausted by the time they reach Sweden! Happy Vernal Equinox to our friends in the North, and happy Autumnal Equinox to us. One thing I learn each day by Tony Lembke. Quora : A Happier New Year? You have been successfully subscribed to What I Learnt Today. Welcome!